“Authentic New Mexican food?” the lady in line behind me with eight Easter baskets stacked in her cart, the kind made of colorful strips of bamboo, answered my request about local places to eat with a question. I made a mental note of her directions, while feeling a little silly about New Mexican food–after all, Santa Fe is in New Mexico, and thanked her for the recommendation. We exchanged information about where we live. She resides in a home outside of the city. My husband and I have our home in rural Oregon, which led to learning that her daughter lives in the Beaver State, too. Our love of the food from South of the Border and the Oregon thing created a connection, and I was glad for the opportunity to speak with her. After purchasing gift wrap for our children’s presents, which we would give to them when we arrived at our son’s home in Texas, we went a few blocks to the little adobe restaurant. 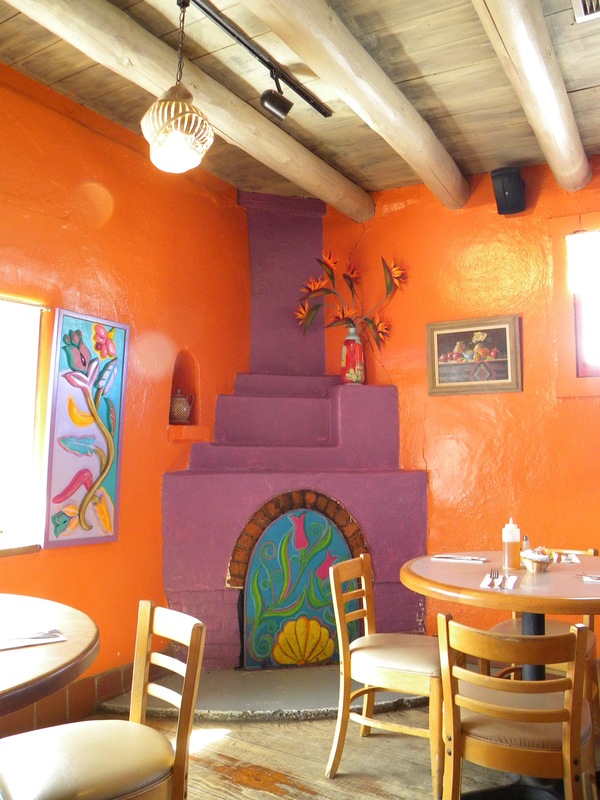 La Choza’s plain exterior gave way to a decorative, southwestern style interior with brightly painted walls, and the flavor of the area’s large Hispanic culture in paintings throughout the dining room. 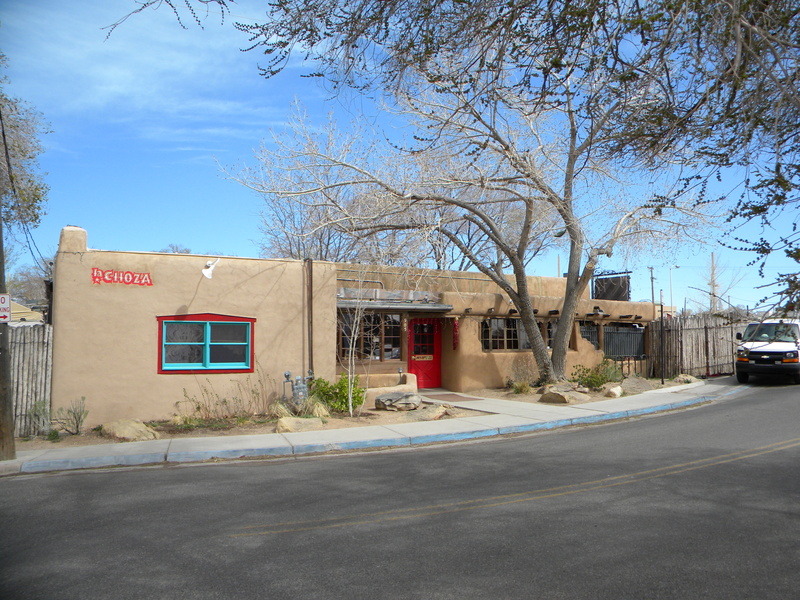 As we learned from the restaurant’s host, the small adobe building was once a part of the Mercer Ranch and is more than a hundred years old. And since La Choza isn’t in the center of Santa Fe’s tourist haven, it’s more of an attraction for locals. Our lunches were served on sizzling dinner sized plates. Chips and salsa weren’t included with the meal–something we’ve never before encountered. We ordered them on the side and weren’t surprised to find the salsa steeped with the flavor of red chile. Southern New Mexico prides itself on its green and red chiles. During our walk from our place of lodging, the Madeline Inn, Vern and I spotted numerous Ristras, which are bunches of dried red chiles, hanging from home porches and outside of businesses. We were in the chile pepper center of the world and we discovered New Mexico’s official vegetable in most everything, from enchiladas to soups to salsas to egg dishes–In this part of the country, they decorate and flavor food with chiles, chiles, chiles. This entry was posted in Uncategorized and tagged Best Mexican restaurant in Santa Fe, Car trip across the south, Discover the Southwest, Easter basket gardening tip, Favorite local restaurant, five star dining santa fe, La Choza, memoir, New Mexico, New Mexico's official vegetable, Pamela Koefoed, Red and green chiles, Ristras, Santa Fe New Mexico, Travel blog, Travel Writing, what to do with Easter baskets, Writer. Bookmark the permalink.